Begin by melting the butter in a medium sized sauce pan. Add vegetables and sauté until just tender. Add flour, stirring constantly over medium heat until well distributed. Gradually add the chicken broth, allowing mixture to thicken. In a separate bowl combine the cream and egg. Blend well. Add about ½ cup of the thickening broth to the heavy cream/egg mixture and mix. Add the mix to the soup, stirring constantly. Continue to simmer at lowest heat. If the soup is too thick, add more chicken broth. About 10 minutes before you serve your soup, add the shredded cheese. Add a little at a time and stir each addition of cheese until it has melted. 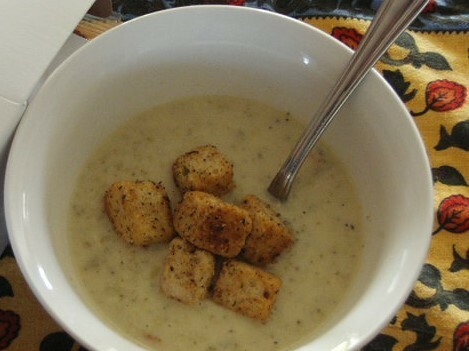 Ladle into bowls and top with plenty of Olivia’s Parmesan Pepper croutons!